According to DMA and Demand Metric, email has a median ROI of 122%, which is over 4x higher than other marketing formats including social media, direct mail, and paid search. Almost 90% of all marketers agree that email marketing is their primary channel for lead generation but how email marketing is being utilized has changed completely. Efficiency is at the core of today’s email marketing strategies, with dynamic and automated campaigns taking a leading role. To recap, automated email campaigns use segmenting protocols to send out specific emails to customers based on user behavior or characteristics. Unlike standard segmenting that requires you to create a unique email for each client segment, automated emails only require you to create one email that will be sent to users who meet certain criteria or take specific actions online. Automated emails can also be personalized by pulling through dynamic content that’s unique to each client. For example, when a customer abandons their shopping cart, instead of having to create a unique email for that customer that includes their name and the products they added in their cart, you can create an automated dynamic email that pulls all of that information through for you and is triggered when customers abandon their shopping carts. Your customer relationship management database is going to be essential for developing and sending out automated dynamic email campaigns. It’s, of course, also critical that you have a thorough understanding of the customer journey so that you can create the right types of emails and send them at the right times. A batch email approach is no longer an effective tactic, with more users expecting a more personalized experience with brands at every touch point. One of the key benefits of automated email marketing is that it uses contextual marketing. This means that your brand is connecting with users at every stage of the customer journey and not just at the point that they’re ready to convert. 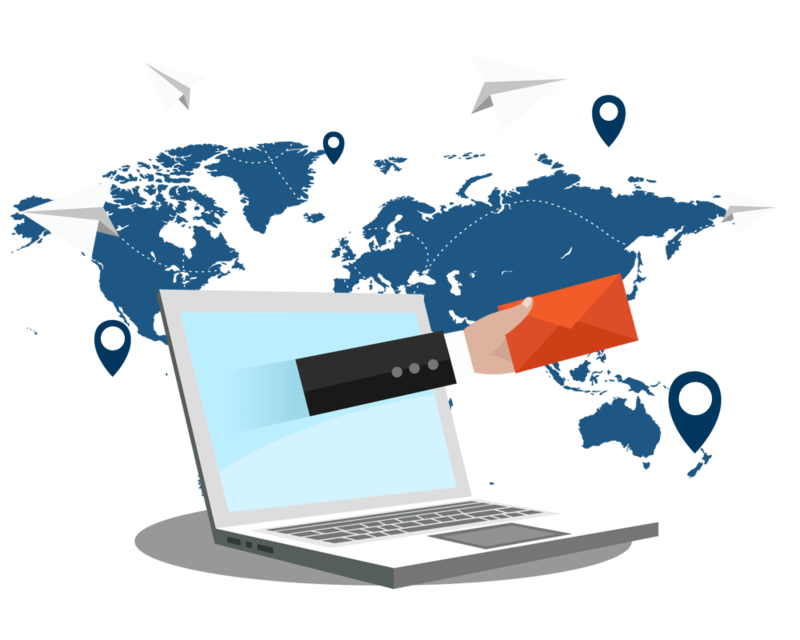 Automated flow campaigns, or email drip series, are groups of emails that are geared towards the different stages of the conversion process and follow a logical flow. In order to ensure that you’re reaching customers at multiple points, you will need to define and create various email flows with the aim of eventually getting customers to make a purchase. Each flow will need to have a different goal and will be triggered according to specific criteria, with each email pulling through unique customer information that will help personalize it. Before you start developing your email flows, it’s important to lay the correct foundation. Spend time mapping out the emails that you feel would be relevant to a user during the buying process. This process will provide you with a high-level overview and you may find that you can actually eliminate certain emails, saving you time and effort later on. If you can’t link each of your email flows to a particular goal, it shouldn’t be included. Linking emails up to goals will also ensure that your emails aren’t overlapping. How many flows you decide to create is dependent on your goals and your unique customer journey. Emails flows can be linked to anything from shopping cart abandonment and newsletter subscribes to encouraging customer loyalty or the completion of lead generation forms. You can also choose to include more than one email in any given flow if you want to reach out to customers about something more than once. Simply put, your flows are meant to bring customers back to your website so that they can complete an action and convert. The key to creating an effective series of automated email flows is getting the logic right. When there’s no logic behind your email flows, you could end up sending out conflicting messages to clients, which could affect your conversion rate. To begin the creation of your flows, you’re going to need to define your email triggers. Metric or Action. When a user takes a particular action on a website or within an email, an email will be triggered. Examples of actions include abandoning a shopping cart or clicking on a link in an email. Manual. Manual triggers are linked to specific lists or segments. For example, customers signing up to receive special offers would be an example of a list, while female users who have recently purchased a baby product would be an example of a segment. User information. Triggers can also be linked to specific user information such as location or date of birth. 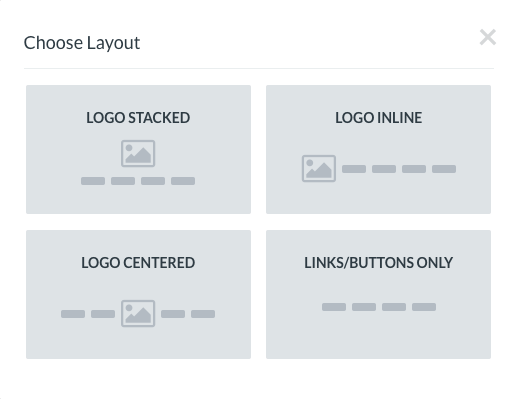 After you’ve defined your triggers, you can start setting up your flows and filters. Filters ensure that your emails are only being triggered when a user meets all the criteria for receiving that email. For example, say a customer abandons their shopping cart. In an effort to not lose that sale, a Cart Abandonment email is triggered. As an extra precaution, you’ve also setup a second Cart Abandonment email that will be sent again after 24 hours. You, of course, don’t want this email to be sent to a user if they do happen to complete their purchase between the first and second Cart Abandonment emails being sent, this is where filters come in handy. Filters make sure that emails are only being triggered when very specific conditions are being met. You will probably spend the most time on filters when setting up your email flows as you have to think of absolutely every possibility in order to ensure that you aren’t sending conflicting messages at the wrong time. Now that you’ve outlined the email flows that you want to create and have defined the logic behind them, you can start looking at the design of your emails. 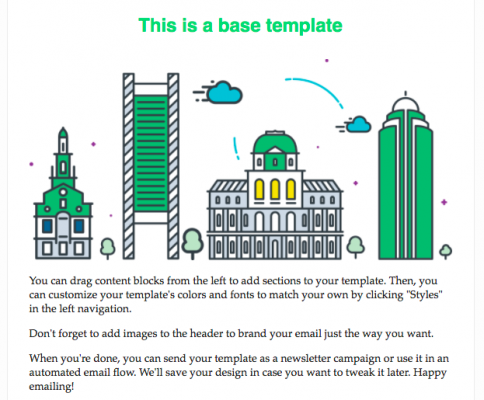 Most email marketing platforms such as Klaviyo will provide you with ready-made templates that you can use or the ability to design your own templates from scratch. Be sure to test your email templates on as many email clients as possible to make sure that there aren’t any issues with the design. Once you have created an email template that you’re happy with, you can move onto your email copy, starting with the subject line. What’s in it for the reader? Your subject line should convey value. What will the reader get by opening your email? Once again, the number one rule for finding subject lines that work for your specific audience is to test and test again. There is also a second part to your subject line: Preview text. Your preview text tells users more about the content in your email but if you don’t create your own preview text, email clients will pull through the first sentence of your email and use that instead. This is generally fine but if the first sentence of your email isn’t compelling, you could be wasting an opportunity to further entice a recipient to open your email. Your email’s preview text could be anything from 35 – 140 characters so make those first few words count. If you’ve gotten a subscriber to open your email, you’re one step closer to a conversion. Your copy is the final piece in your email puzzle and could mean the difference between a sale and an email being deleted. Tell them what to do next. Don’t forget to insert a clear call to action! Whether you want to import your contacts using a CSV file or directly from your previous email service provider, Klaviyo makes it very easy to transfer your current email database. If you aren’t using any of the above services, you can simply format and import a CSV file. Upload your CSV file by clicking on Lists and Segments and Create List/Segment. These various integrations ensure that brands can reach customers at more touchpoints and drive more conversions. These platforms can be integrated with one click and will generally only require a URL or API key in order to link it to your account. 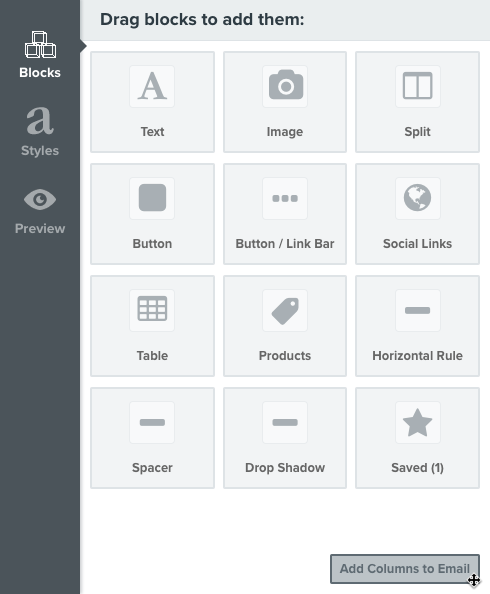 Use text and images blocks to start building the body of your email. 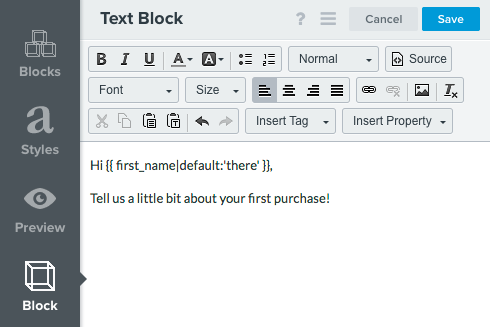 You can also add elements such as Product Blocks that pull through product catalogs, buttons that will allow you to insert a call to action and dynamic tags that will help pull through personalized information for each recipient. Your emails footer is where users will expect to find links to unsubscribe or manage their preferences. 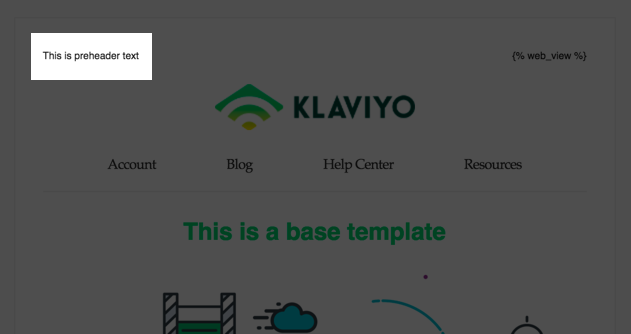 Klaviyo has tags that you can use to insert these links. Your footer is also a good place to include links to your social media accounts. You will then be prompted to select the most relevant flow trigger before selecting an email list or customer segment to link to the flow. If you select Takes an Action, you will be prompted to select an event metric to trigger the flow. You will then have the opportunity to add one or more filters to that action. You can now configure the content of your flow emails by clicking on the email card and clicking the blue Configure Content button. This will allow you to update the sender information, add a subject line and insert content in the same way that you did when setting up a campaign. You can now change the status of your flow to Draft, Live or Manual. Manual flows won’t send automatically and need to be manually reviewed and scheduled. 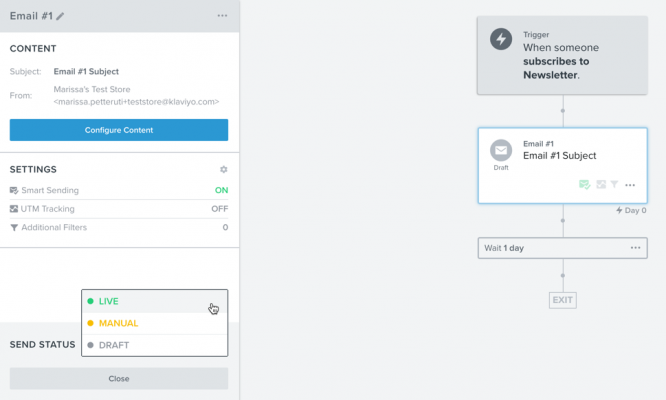 Live flows will send automatically when a recipient meets the specified criteria. 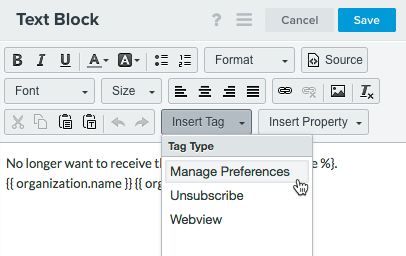 The next step will be to add trigger and flow filters to your email flow. An example of a trigger filter would be to target someone who orders a specific product. A flow filter, however, targets users who meet specific criteria and took a specific action. A person who ordered a certain product and lives in Canada would be an example of a flow filter. Multiple filters can be added to an email flow. Personalize your automated email campaigns by adding in dynamic content such as a recipient’s name. When editing your email template, click on the Insert Property drop-down menu and select the property that you want to insert. If you’ve added extra properties to individual contacts in Klaviyo, you can use them as dynamic content in an email with the person variable and the lookup filter. Event variables can be used to pull through specific product information based on what a user just purchased, left in their cart or was viewing on your site. Klaviyo automatically stores detailed event information for you so that you can use the appropriate variable to add dynamic event content. The information captured is specific to each metric. While dynamic email campaigns do have a lengthy setup process, once your templates, flows, triggers and filters have been added, you’re one step closer to creating highly-effective campaigns and flows that will offer your customers a more personalized brand experience and send a lot more conversions your way. Want to see what Klaviyo can do for your brand? Sign up for a free trial here. At CoolCat Digital we believe in excellence and we believe in delivering results. For any inquiries or consultation please feel free to CONTACT US.